We are heading off to the coast tomorrow for a week. I feel very fortunate that the weather is holding out and that our not very long at all drive to Wales may take us to a holiday that feels a little more further afield. This past week or so I've loved doing the school run and feeling like I've been exploring foreign lands (seriously, the dusty ground is a novelty round here). On the theme of exploring we are planning to tackle Snowdon whilst we are in that area (3,560ft alt) and I'm looking forward to that as its been a long time since we had any real adventures on our own (we'll be leaving the children with their grandparents for the day). I'm also looking forward to having mini adventures with the smalls each day too and have come up with a field explorer kit - which Dominic can't wait to get his hands on. 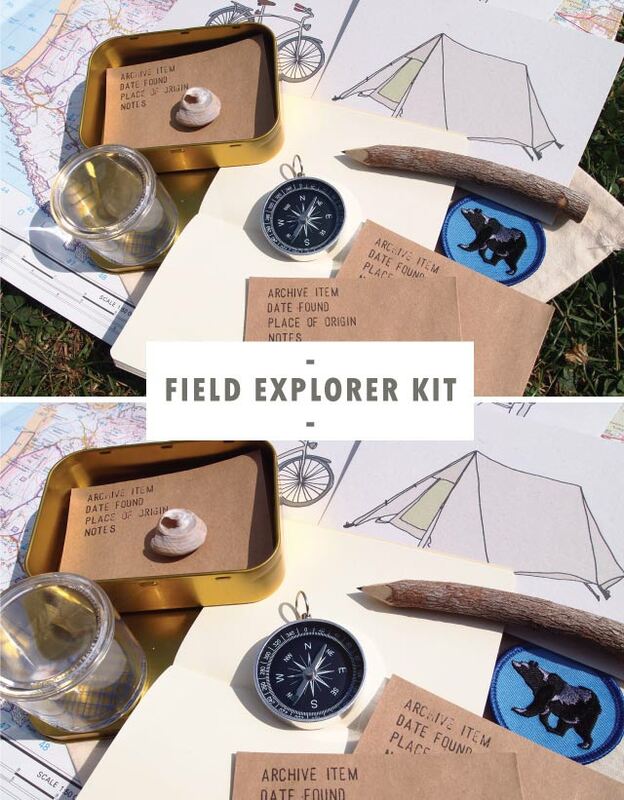 Feeling fully inspired by Moonrise Kingdom (seriously in awe of the list making and organisation skills of Sam and crushing on the style of Suzy) to be prepared for an adventure, I've curated a kit full of items that are great for camping (or a camp themed holiday) and exploring in natural surroundings. I have to say all the while I was also thinking "Adventure is out there!" and wanting to get a leather pair of aviation goggles on and put my thumb up (Up style). You can have a go at compiling your own kit with a bug viewer, note pad and few other essentials or you can save yourself the trouble and buy one here.